George Graham Reviews Corey Harris & Henry Butler's "Vu-Du Menz"
The continuing popularity of the blues has provided opportunities for a good number of up-and-coming performers, as well as chances for record releases by veterans who had rarely recorded before. It has also opened the doors for different styles and approaches to be heard. Although the blues means different things to different people, probably the most popular perception is that of energetic electric music played by either veteran performers who worked their may up from humble rural beginnings, or by the younger rock based players who are the ones who seem to sell the most records. But the long history of the blues starts with acoustic music. This week, we have a gem of an album by two especially noteworthy blues artists, both based in New Orleans, combining forces to make music with just an acoustic guitar and a piano, and having an infectiously good time in the process. 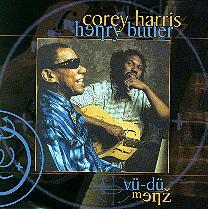 The CD is by Corey Harris and Henry Butler, and they call it Vü-dü Menz. This CD breaks current stereotypes in a number of ways. First of all, by being all-acoustic and without a rhythm section. Second, by featuring the piano so prominently. Third, by consisting mostly of original music that sounds as if it was written in the 1930s, and perhaps most interesting, from the background of the two players involved. Most people's idea of a blues performer is that of a self-taught musician coming from a poor background. Harris and Butler, though separated in age by 20 years, are both well-educated African-Americans with masters' degrees and strong academic backgrounds. But both in recent years have individually attracted attention and large amounts of critical praise for their own way of approaching and in some ways re-defining the blues. This CD, however, takes them back to their musical roots, at least in form and sound, though with new material. Guitarist Corey Harris, the younger of the two, at 31, is a native of Denver, Colorado, and was first introduced to the blues by his mother, who played him Lightnin' Hopkins records. He learned to play various brass instruments in high school, then after attending Bates College in Maine and further cultivating a love for acoustic blues, moved to Cameroon in West Africa for a while, and absorbed African polyrhythms. Returning to the US to a teaching job in rural Louisiana, Harris gravitated to the New Orleans music scene, and among other things, moonlighted as a street musician where he began to be noticed, was soon playing in clubs, and eventually went into the studio and released his debut album in 1995, which quickly won rave reviews. His subsequent work, including two more CDs and appearances sharing the stage with well-known rock performers like Natalie Merchant, have reinforced Harris' reputation for a combination of sensitivity to tradition and innovation. Pianist Henry Butler, at age 51, has had an equally diverse career. Blind since infancy, Butler trained in classical music, he was considering a career and as opera singer, but was also attracted by jazz. Among his jobs were as a talent coordinator with Motown Records and for Stevie Wonder. After moving back to New Orleans from Los Angeles, he established himself playing with a lot of the city's leading jazz and R&B musicians while teaching at the New Orleans Center for the Creative Arts. He won accolades for his jazz CDs on Impulse and Windham Hill Records. Two years ago, Butler released an amazing album called Blues After Sunset, which was a combination of piano virtuosity steeped in the New Orleans tradition of people like Professor Longhair and James Booker, with his big-voiced vocals and guests including harmonica man Charlie Musselwhite. These two well-schooled New Orleans-based musicians are an excellent combination as much for their stylistic contrasts as for their similarities. Harris is more into the rural blues while Butler draws on jazz, boogie-woogie and ragtime, along with the New Orleans piano tradition. But when they meet, they both bring their deep knowledge of the music, excellent musicianship, and genuine enthusiasm and sense of fun to the project. It's a blues album that can really make you smile -- and that really was what the blues was for in the first place, music to make you feel better about your troubles. One interesting aspect of the CD is the range of lyrical content of their original material. There are songs about some of the standard blues topics, along with some of the double-entendres which the staple of old blues tunes. But Harris, especially, can get serious and make social statements in the songs, and there is one piece about the now-famous liaison between Thomas Jefferson and the slave Sally Hemmings. While most of the tracks are duos, with Harris doing the lion's share of the vocals, there are also a couple of solos pieces for each of the pair, and except for some washboard percussion on two pieces, it's just the two them obviously having a good time together. Vü-dü Menz, the new release by Corey Harris and Henry Butler is an album that both breaks stereotypes of the blues and also gets back to first principles. These two erudite musicians draw on their academic backgrounds and appreciation of traditional country and rural blues to make original music that sounds very much as if it is sixty or seventy years old. They concentrate on acoustic blues while at the same time bringing to bear some new ideas, Harris lyrically and Butler with his astonishing piano technique that brings some of the sophistication of jazz without losing the essential blues feel. And though this album has some serious musicianship and thoughtful lyrics, it always sounds as if they are having a great time, and that makes this an instantly likable and downright fun album. Our grade for sound quality is pretty close to an "A." The acoustic instruments sound acoustic, and there is a decent dynamic range. Sometimes the vocals can get a bit obscured by Butler's spirited piano work, but most of the time the mix is first-rate. While acoustic blues will probably never displace the teen pop bands at the top of the commercial music charts, it's great that non-electrified blues is making a comeback in the current musical environment. Corey Harris and Henry Butler have both been leading the charge individually, and together they have created an album that is my choice for one of the best blues albums so far this year.